How do Inventory Transfers work? Inventory transfers allow you to move inventory from one warehouse to another. This is broken down into two parts: Sending the inventory and Receiving the inventory at the new location. 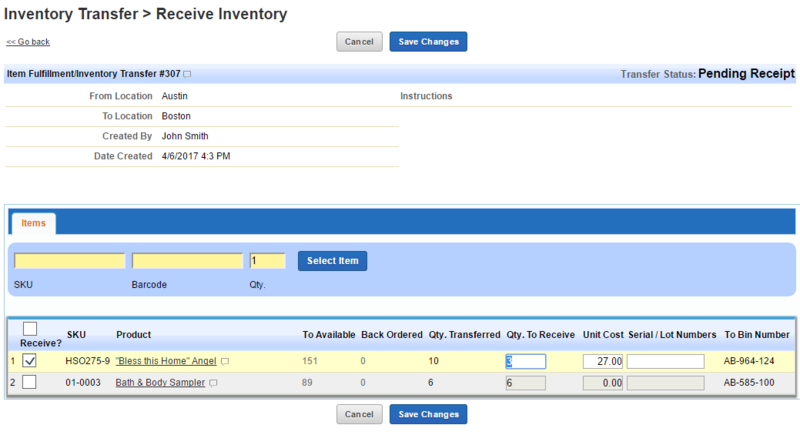 Start a new transfer by going to Products > Inventory tab > Inventory Transfer. Select the From Location and To Location warehouses. Expected Receipt Date is not required. 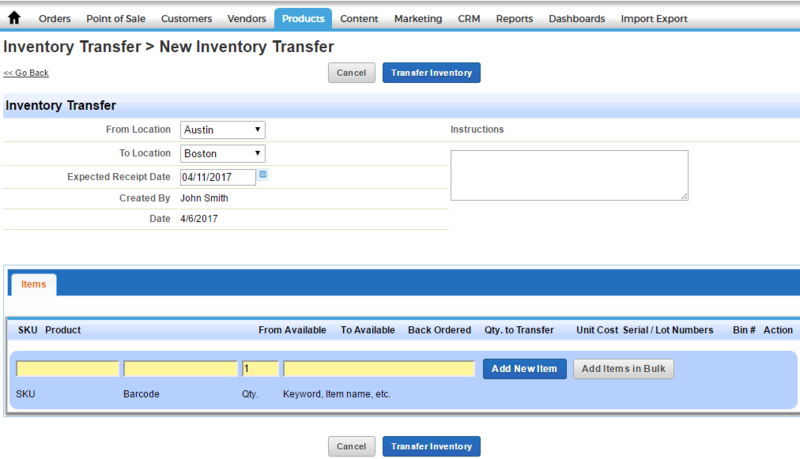 Add the SKUs you wish to transfer inventory for, either via Add Items in Bulk, SKU/Barcode, or searching and filtering via Add New Item. When you are ready, Transfer Inventory. You can find the list of all transfers under Products > Inventory tab > Search Inventory Transfers. Note: You can print the Packing Slips, Picking Lists, and Barcodes for all items on the transfer. Note: The default sorting of the columns for the picking list is based on the general setting Picking List Sort Order. You can Receive the transfer from the search screen, or drill into the transfer and Receive Transfer. Here, you can select each line item and record how much quantity you have received in this shipment at the warehouse. Alternatively, if your products have barcodes, you can scan each product to increment the Qty. to Receive count by one each time. Once you have confirmed the count for all SKUs, Save Changes to add these counts to the new warehouse location.